it up into a tart pan.. She found the tart pans on Amazon.. We cut a piece of sticky board into a round shape.. I added batting on top of that and then stuffing on top of the batting. I then added the stitched piece and hot glued it around the back .. I ruffled a strip of torn red homespun and added that to the back so a little would peek out around the edge of the tart pan. 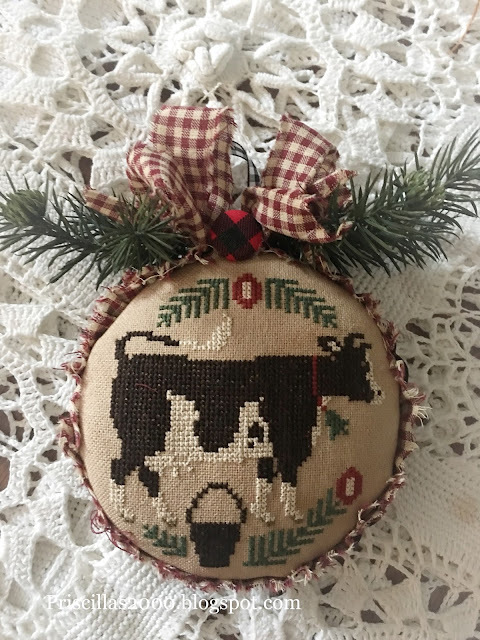 I added some sprigs of greenery ..a bow from the homepun and a buffalo check covered button.. 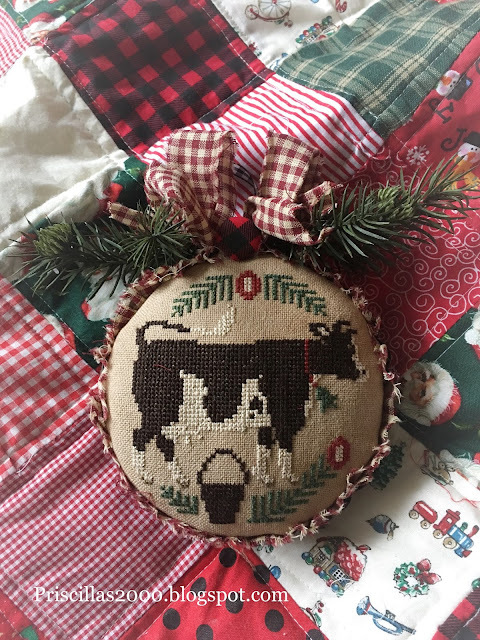 It is adorable and now I have to stitch all those animals! The latest floss tube video.. I think that counted cross cow is simply darling. It has been ages since I have done any counted cross myself, but if anything were to put me in the mood it would be that. Those PS patterns are always simple and fun. I have several leaflets. I love how you finished it off in the little pie tin, and thank you for the info. I love it! Love it Priscilla. I have this one stitched and ready to finish. The tart pan is a great idea..
Oh this is just adorable and perfect! I agree, very cute plus what a great finish! 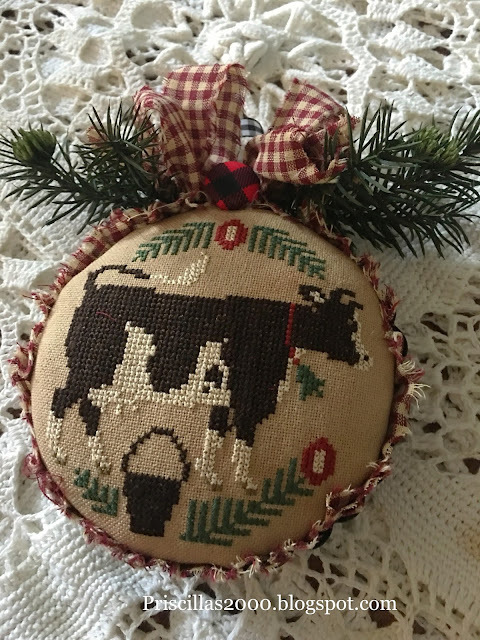 The ornament will be cute addition to a country/farm Christmas tree. That is really cute! And I love how you turned it into an ornament using a tart tin. This is one of my favorite finishes <3 I can't wait to see the other animals stitched up & finished. How pretty these will all look on a Christmas tree! I already own this chart & I'm definitely going to be stitching me up some tart pans too. I just took a class on punch needle & thought I could make some little ornaments using that technique & tart pans too <3 Thanks to you & Chelsea for the AWESOME inspiration. I will share photos with you if I ever get them finished :p I've completed the 'big' portion of Sunflower Manor - it's GORGEOUS! - and I've got to start on the Autumn chart this weekend. Happy Halloween in a Tray!